Previously covered in Burrell Guitars – Instruments That Conform to the Guitarist , Leo Burrell takes a radical approach to guitar design particularly where it comes to acoustic guitars. 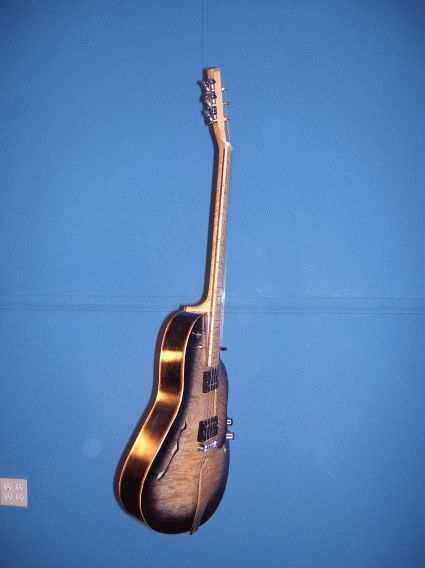 Leo’s instruments twist and conform to fit the way the guitarist rather than force the guitarist to conform to the instrument – a fine example of ergonomics. Head on, the guitars look quite similar to conventional acoustic guitars but the following images reveal the story. As far as guitars go, Leo Burrell feels that “the real work is in fitting the Acoustic Guitar to the Artist”. Indeed, compared to some of the examples we’ve seen of electric guitars, acoustic guitars have lagged far behind in terms of ergonomic design. However, as we can clearly see, Leo has focused on this and delivered a truly unique instrument. For more, see Burrell Guitars. Great design! Very innovative! It would be nice to have an explanation of how and/or why this specificly design helps ergonomics. Keep on, great blog! I’ve alredy voted for you! Hey Gabe – Take a look at the previous Burrell Guitars article referenced above. It describes some of the features that take ergonomics into consideration. And, thank you for both the comment as well as the vote! So awesome. 🙂 Unique approach to the headstock, too. Hey Greg! The headstock is definitely another element designed for ergonomics. All strings can be easily tuned on the same side of the headstock and without having to switch your thinking as to how to turn the tuners. Yes, the tuner arrangement looks interesting. But I can’t really see from the pictures what they actually “do”. Do the tuner knobs for the G, B and E strings point downward? The tuner pegs don’t seem to be angled, so it must be some custom tuners. Do any of you know? Alex – I added another picture to the article to better illustrate what Leo does with the tuner arrangement. Hope this helps! j’ai joué, hier 6 juillet 2007 au salon de la guitare de Montréal, avec une guitare accoustique de Leo Burrell. Leo Burrell est un bonhomme très sympathique et pas du tout avare d’explications. i`m guitar maker over 22 years. Never seen before some like that. Great job. Welcome to the site, radulovic! Take a look around. You’ll find a number of unusual guitar designs on the site. This Best of 2007 roundup is a place to start. You can then dig through the electric guitar, bass guitar, and acoustic guitar archives for more examples. I wonder, the rest of the guitar is very ergonomic, and so is the string placement on the headstock, which mean the strings goes at a much straighter line to the tuners, but what is this ballyhoo about hand twisting up there? Is this really a concern for most people? How much time do you spend with your hands up there, tuning, compared to playing? It must really be something else why it’s done like that. You just twist the tuners until they are in tune, and provided that you’ve done everything right, one hardly needs to go up there anymore. A lot of people even tune with the other hand while playing, leaving the fretting hand with, maybe, RSI alone. Then if one should carry on the idea, and following through, one should discuss ergonomics when changing strings on a guitar as well. One does that just as rarely as tuning. Can be hazardous. On a headless, there’s two ball ends, you just know where to put them, and no 12 twists first around the post with the loose and SHARP and dangerous string end! 🙂 And stop to wonder if the tail end was locked “inside” or “outside” of the post maybe leaving you to have to turn the tuner the other way in order to tune it. Taking ages! 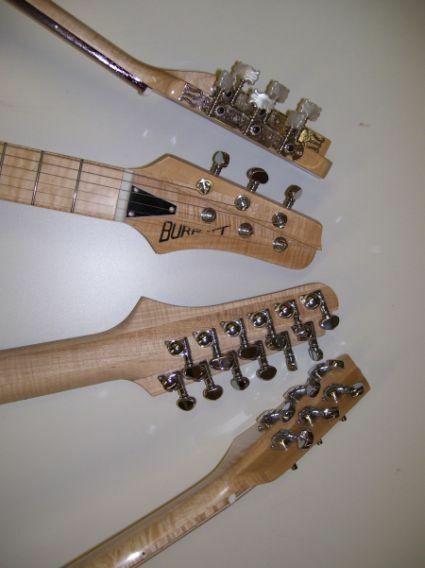 Locking tuners would be more suitable on Burrels guitars. I mean, if we should nitpick about ergonomics. 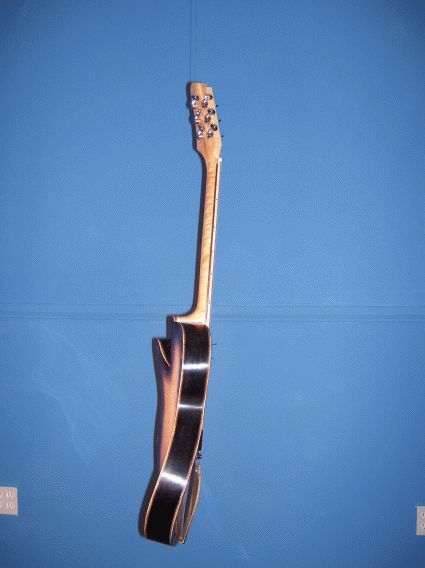 Hey Mats – I didnâ€™t realize that my two sentences about the headstock would cause a â€œballyhooâ€ but so be it! 🙂 But it was an an interesting enough feature to mention and relates to control layout so I understand why readers took note of it. 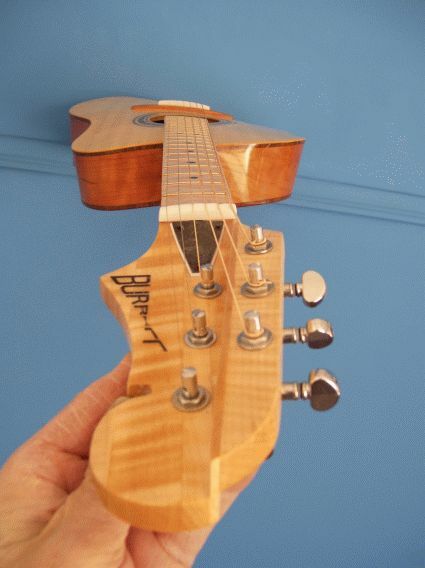 And while it may not relate to injury prevention, ergonomics includes ease of use and Burrellâ€™s unique headstock qualifies with its tuners lined up on the same side and all turning the same direction. Some might say itâ€™s not easier to use because it requires retraining but thatâ€™s hardly a valid guideline. Thatâ€™s equivalent to saying you’re going to stick to the poor technique you’ve already developed rather than make the effort to develop better technique. I have owned two Burrell guitars starting about three years ago. One is a six-string Jazz electric and the other a 12-string Jazz electric of similar body style. I equipped the six string with custom Tom Shore pickups made available to me by Rockit music in southern California–very mellow, very jazzy. Very $250. I play sitting down, so the guitar’s right for me. This is not curved in body shape just “to be curved”; it really does fit one’s contours: back side of guitar to fit the player; front side to assist and not hamper ideal playing style. I bought two when they were prototypes. I wouldn’t think of selling either. They’re unusual and very nice. Leo built me a custom neck that was thick so that I don’t have to squeeze my hand so to make barre chords on the 12-string. (I’ve had carpal tunnel surgery on both wrists, and some of my other eight guitars a can’t play for any length of time at all owing to the thin necks on them.) I’ve never played Burrell’s non-electric Spanish style, so I have no recommendations. But the jazz guitar is nice; the pickguard and tailpiece match the guitar finish exactly and visually don’t stand out. The builder emails promptly in response, so that is nice. Christian shop too. These have some very very interesting elements — reminds me a bit about Rick Toone’s Orchid bass, the way it wraps around the body. Headstock idea is interesting in terms of saving space and — only think like that i can recall is MCClaughlin’s big custom Rex Bogue doubleneck from the mid-70s, where they reversed every other tuner on the 12 string neck to keep the two necks visually identical. As for the ergonomics, I found that it was much easier to bar the chords, ie., didn’t have to hang the thumb over the E string on an F chord. I did not have to retrain to use. Arthritis and operations have hampered my ability to play. The Burrell has taken the strain out of my wrist and fingers. Thanks for the owner feedback, Freddie and welcome to BTEG.